Our CTO sits down and talks about innovation, how its important, why should we do it, and how we start a fire underneath people who can innovate. Interesting talks hosted by Calvin Smith of the OCTO. This entry was posted in EMC, innovation and tagged Center of Excellence, CTO, EMC, Global Innovation, John Roese, Vic Bhagat on February 12, 2014 by wallnerryan. It’s been about 2 months since my last post, so let me fill you in on something I’ve been slowly working on. While doing research in my last semester as an undergrad at Marist College and working for EMC as an SE Intern I came up with what i thought would be a pretty neat idea. The idea started with the fact that I had been working with Ganglia Monitoring System and then I came across a gentlemen names Brian Bockelman from Nebraska. I had a brief conversation about gridFTP with him, how it would be nice to monitor the hosts running gridFTP and be able to react to load on the network using the network controller. Thus, where host-aware networking came from. Because ganglia uses RRD (Round Robin Database) files to store time sensitive information about a specific host, using this, each host can store information about their network load, cpu usage, memory that is free, etc. What I wanted to do was mux the SDN environment with the scale-out Ganglia Monitored network so I could make network decisions based on data I was getting back from the monitored hosts. The controller should be able to “poll” the data from the hosts it knows are being monitored. The data should relate to “thresholds” set by a network admin, so when a threshold is met, the network reacts via the controller. Off the bat I needed a controller, I’ve used Floodlight before and it has a great open community for developing opensource, so I pulled the master off git and threw it in my development environment. My development environment consisted of 2 x86 boxes that ran KVM and Openvswitch. (this could certainly work for monitoring compute nodes within an openstack environment, or even guests within a specific tenant). Openvswitch provides my openflow connections to Floodlight as well as the data flows between virtual interfaces on KVM. Here is a diagram that should visual the dev environment. This environment is pretty simple, but does the trick. I ran the Floodlight Controller inside the KVM hypervisor on one host and just Ubuntu VMs for the rest. Download or use apt-get to install ganglia. Take note that the node in which Floodlight sits on, also has the gmetad server on it. This is because ganglia metrics from the different cluster are collected in /var/lib/ganglia/rrds/ and the Ganglia Modules will look for this directory. This setting is also configurable incase you set Ganglia to collect them somewhere else. The gmetad server can also export its directory via NFS and can mount on the controller node if you didn’t want to run gmetad on the Floodlight host. I want to eventually have the controller connect to a rrd socket but I thought this was unnecessary for a PoC. I configured the gmonds to speak UDP to limit network traffic, but ultimately you can use Multicast or UDP, the Ganglia setup really doesn’t matter too much, only that a gmetad directory be located where the controller resides. Once the environment was setup I could start to dive into development but there were a few major design choices I had to consider before I stated to do so. 1) How would I read RRD files from the underlying filesystem? Meaning what interfaces were out there, should I make my own, what RRD functions do I need? 2) What methods was I going to take to consistently poll the data?Are there priorities?, variable polling times? Timing? My design decisions led me to these conclusions. I had thought about running cron jobs to dump the RRD files to XML ever so often and read it via streaming or DOM based XML interfaces with java. This wind up getting thrown out the windows for a few different reasons. 2) I decides to represents “Monitored Hosts” and “Ganglia Rules” as objects within the modules, this abstraction allows me to associate rules with hosts, rules can also provide a “pollingTime” variable which tells the controller how often to poll the host for rule thresholds. Once a threshold is met, the “Action” is then carried out, which could be to push static flow, add a firewall rule, drop traffic etc. Essentially anything the controller can do. Priorities and timing were a must for rules as well. Add a Rule that defines metrics to be monitored, a threshold for those metrics and associate it with a Host that is actively monitored. Rules can also be “met” a certain amount of time before the controller action is carried out. You can then view the reactions to the metrics being polls at /hand/gangliahosts/messages (this is not final URI) but this will show INFO, WARN, THRESHOLD_MET, messaged for your hosts and what the controller did. In the end I tried to code this project with a 2 month time frame, It is mostly done and still in test, but hopefully I can get it out the community to share some of the need things I was able to do by monitoring hosts within a Floodlight controller and reacting to metrics read by the controller. This entry was posted in Data Center, networking, SDN and tagged floodlight, ganglia, kvm, Monitoring, SDN on October 28, 2013 by wallnerryan. Compute nodes represent a potential bottleneck in an OpenStack Cloud Environment, because the compute nodes run the VM’s and Applications, the workloads fall on the I/O within the Hypervisor. Everything from Local File system I/O, RAM Resources and CPU can all affect the efficiency of your cloud. The notion of tenancy is also important to keep track of, tenant size and activity factors into how your environments resources are used. Tenants consume images, snapshots, volumes and disk space. Consider how many tenants will consume your cloud and adjust your resources accordingly. Make sure if you plan to take advantage of overprovisioning think about thin provisioning and potential performance hits. Running Ubuntu linux 3.2.00-23 kernel ns qemu-kvm-1.0. This should mean that running multiple VM’s should have better performance. This entry was posted in cloud, Data Center, Uncategorized and tagged kvm, nova, performance on August 1, 2013 by wallnerryan. The world of IT Systems Administration, DevOps and Orchestration of bare-metal resources to virtual applications is starting to have the need to become fully automated with custom hooks for different scale-out HPC workloads, cloud environments, to single deployments for SMBs. Automation via specialized scripts for network and compute need to become a thing of the past. I personally have had the opportunity to work with Foreman, Heat, Puppet, and (somewhat) Chef. The others also contain great ways to automate from bare-metal, all the way to fully virtual “stacks” of network, compute and storage. Puppet and Chef share a space in the IT automation industry and both succeed in their vision. Whether you decide to use Puppet or Chef depends on your alignment and what you’re trying to accomplish. I’ve heard that Chef’s master node scales better but have personally never tested this theory. Both try to accomplish sub-version of package management and configuration control over a subset of nodes in an IT environment. Razor bare metal provisioning was developed as a venture between EMC and Puppetlabs and offers a path to full automation between the two, Not to say that any other DevOps tool or bare-metal provisioning workflows can’t be substituted, I may just be a bit bias. Client-server based. Puppetmaster and Puppet Clients. Declarative Language for “write once deploy many”. Has open-source Openstack Packages for on-demand Openstack Delivery/Configuration Version control. Integrates with Openstack Heat/TripleO for managing packages and configurations. Deployment of monitoring tools, security tools all possible within private cloud. Client-server based orchestration management “infrastructure as code” for deploying applications, version control, config files. Written in Ruby. “Cookbooks” CB’s can be written to deploy Openstack “Chef for openstack” components, and potential to deploying security, monitoring etc. Like heat, JuJu deploys and manages services and application within a cloud provider. 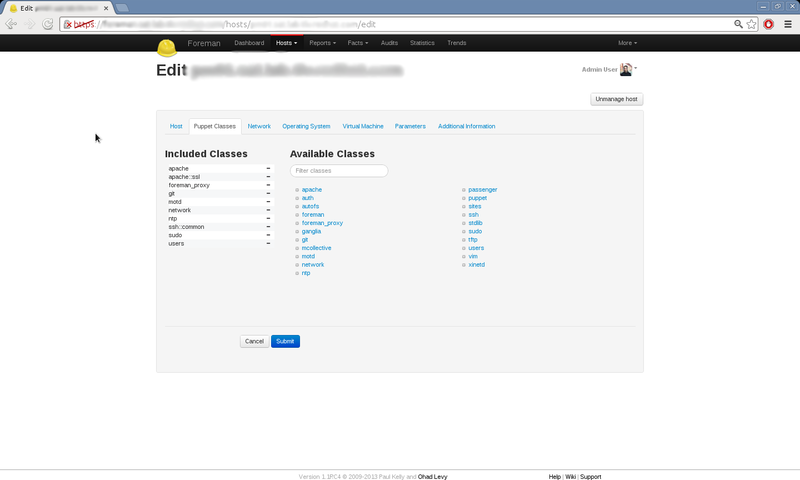 JuJu can deploy openstack components (e.g Glance) or deploy applications (e.g wordpress) on top of existing clouds. Heat is an orchestration tool for managing “stacks” or applications deployed on the cloud. Heat can orchestrate ports, routers, instances, Floating IPs, Private Networks etc. Provides OpenStack-like CLI and Database show, list, create methods for interactions. Dynamic “Cloud on Cloud” version control of your cloud. Need a “seed” cloud stack to provision 2 HA Nova Bare Metal (Ironic) servers, these bare metal stacks will provision a “overcloud” via Heat, the bare metal servers will know about available nodes via node enrollment via MAC Address. Integrates well with Puppet/Chef for Package Management/Configuration if you did not want to use Heat. Comes with a set of tools, os-apply-config, os-refresh-config, diskimage-builder. diskimage-builder is used to build custom images with a notion of “elements”, these elements can be anything from a service, a application, a database, etc (e.g Glance, MySQL) and you can add them to the image you build. Quit a useful tool by itself actually. Complete solution for pxe booting, not really a package mgmt. or config solution. Chef has pxe_dust recipe, AFAIK is interoperable with Chef. operating system installation via PXE Boot. Cobbler is a Linux installation server that allows for rapid setup of network installation environments. It glues together and automates many associated Linux tasks so you do not have to hop between many various commands and applications when deploying new systems, and, in some cases, changing existing ones. Cobbler can help with provisioning, managing DNS and DHCP, package updates, power management, configuration management orchestration, and much more. With a simple series of commands, network installs can be configured for PXE, reinstallation, media-based net-installs, and virtualized installs (supporting Xen, qemu, KVM, and some variants of VMware). Cobbler uses a helper program called ‘koan’ (which interacts with Cobbler) for reinstallation and virtualization support. xCAT’s purpose is to enable you to manage large numbers of servers used for any type of technical computing (HPC clusters, clouds, render farms, web farms, online gaming infrastructure, financial services, datacenters, etc.). xCAT is known for its exceptional scaling, for its wide variety of supported hardware, operating systems, and virtualization platforms, and for its complete day 0 setup capabilities. Allows for a stateless boot (boot off/download RAMDisk image of xcat management node) with available scratch disk for persistent data on reboot. Satalite files (NFS mounted filesystem ) allows for other reboot/persistence. Though, in both cases, no stateful information should be allowed on either. Developed by IBM, Power and Z Support. This entry was posted in cloud, development, devops, software and tagged automation, baremetal, chef, cobbler, crowbar, heat, puppet on July 31, 2013 by wallnerryan.